It is widely accepted that the Bible contains many accommodated descriptions of God; the finite human mind cannot comprehend the infinite God, so he has revealed himself to us in ways which we can understand, even though the true reality of God transcends what the scriptures say. For example, most Christians believe that the scriptures teach the immutability of God, so the times when the scriptures say God changed his mind (such as Exodus 32:14) are understood to be accommodations. The wrath of God is believed by many Protestants to be a real attribute of God, but an accommodation by many other Christians. The wrath of God is important because it forms part of the foundation of penal substitutionary atonement. What is the basis for believing that God's wrath is not an accommodation? Good answers will give exegetical and logical arguments why certain verses should not be interpreted as conveying only accommodated depictions of God's wrath. Accommodation means that we use finite terms to describe an infinite God, and thus naturally come up short. This is certainly true, so in some sense every description of God is an accommodation. However, that does not mean a given description does not correspond to a truth. Thus, for the purposes of this answer, I am restating the question to be "What is the basis for believing descriptions of God's wrath correspond to a true aspect of His nature?" which I think is the real question here. So, if anger is not automatically sinful for man, then there is no need to "explain" God's anger. And there is a real danger is seeking a way to explain away things that make us uncomfortable. If "negative" emotions attributed to God are merely accommodations, who is to say that "positive" ones aren't? Perhaps God is actually ambivalent to humanity and we just think He loves us because that of our finite understanding of God... It is one thing to say the "eyes of the Lord" (e.g. 2 Chronicles 16:9), which can easily be read as a metaphor in context, are an accommodation. It is quite another to say something (e.g. wrath) that is explicitly described as an attribute of God is one. I will now analyze some specific verse that illustrate that the "wrath of God," while perhaps not a 100% perfect description, is a fundamentally accurate way to describe an aspect of God. The list is by no means exhaustive. Paul's argument here is that everyone is without excuse for knowing God because his actions are plainly seen, and from these actions his divine attributes are evident. To back up his argument, he says the "wrath of God is revealed from heaven." That is, evil and unrighteous behavior have clearly been punished. If God was not truly wrathful, and was only described that way for our benefit, then Paul's argument would have no force. The unbelievers certainly could not be expected to naturally perceive wrath that did not actually exist. Indeed, the wrath of God is contrasted with "the righteousness of God [which] is revealed from faith for faith." (v17) While righteousness can only be seen through the eye of faith, wrath is apparent to all. One would have to jump through hoops to explain how the "unreal" wrath of God is apparent while the "real" righteousness of God is invisible to unbelievers. A similar theme is found in Deuteronomy. Here, we have two instances of a specific sin (turning away form God) leading to a specific punishment (barren land). The specific language makes it difficult (exegetically) to see this as anything but a literal description. Furthermore, this punishment is something that "all the nations" will recognize as God's wrath (v24). If wrath was a mere accommodation and not actual action by God, it is hard to explain how Gentiles will understand that God is in action here. We know that the judgment of God rightly falls on those who practice such things. Do you suppose, O man—you who judge those who practice such things and yet do them yourself—that you will escape the judgment of God? Or do you presume on the riches of his kindness and forbearance and patience, not knowing that God’s kindness is meant to lead you to repentance? But because of your hard and impenitent heart you are storing up wrath for yourself on the day of wrath when God’s righteous judgment will be revealed. In this passage, Paul clearly ties the wrath of God to His righteous judgment of mankind. By doing evil, the sinner is "storing up wrath" that will be result in judgment on the "day of wrath." If the wrath being stored/delivered is not literal or not roughly equivalent to human wrath, then it is difficult to see what "tribulation and distress" the sinner will be suffering. Note also that the suffering is tied not an abstract person, but rather "the Jew" and "the Greek" - precisely Paul's original audience. If we were to understand this passage as a metaphor for God's character, we would expect at least some sort of textual clue, but instead the message is delivered in very concrete terms, and explicitly directed at the (original) reader. These verses uses the doubled pronoun I myself to emphasize the personal nature of God's punishment. If, for example, man's punishment was just the natural consequence of sin and not a direct action of God (i.e. if God's wrath was accommodating language), this emphasis would be out of place. Furthermore, the sevenfold nature of the discipline would seem to indicate that the punishment is more than the inevitable consequence of the sin. The author of Leviticus is making it quite clear that the punishment given is from the direct action of God, which means it emanates from an actual aspect of God's nature. Jesus on Earth can legitimately be described as angry, and He describes judgment of certain groups in harsh "wrath-like" terms. As such, it is only natural that passages that describe God's judgment in heaven in similar terms be read as accurately describing a true aspect of God's nature. Another reason to believe that the wrath of God is not merely an accommodation is that the descriptions of wrath occur in a wide variety of contexts. It occurs in history writings (Exodus 32), the Law (Leviticus 26), Poetry (Psalm 59), prophetic writing (Isaiah 13), the Gospels (Matthew 11), letters (Romans), and of course the Apocalypse (throughout Revelation). Wrath is attributed to God the Father, Jesus, and the Holy Spirit (Hebrews 3). It is brought against Israel, Gentile nations, mankind as a whole, specific individuals, and the Serpent/Satan (Genesis 3). It is hard to find a context where God's wrath is not described in some fashion. The idea that God's wrath is an accommodation stems from a desire to avoid the difficulty in seeing God as angry. It is often phrased in a condescending fashion such as "ancient people needed to see God that way, but we moderns know better" - either by believers to make God more palpable, or by nonbelievers in an effort to discredit the Bible. The idea that anger is wrong does not stem from the Bible, however, but rather a man-made sense of the "enlightened man" ideal where man acts rationally and without emotion, or at least without negative emotion. This "ideal" is directly contradicted by the Bible and also carries unwarranted pride in one's own intellect. In reality, emotion is an essential part of human nature and logically an essential part of God's nature if we are indeed created in His image. Just as one cannot fully understand God's infinite, perfect love, one cannot fully comprehend His wrath either. That, however, does not mean that our terms to describe His wrath do not correspond to a true aspect of God. Furthermore, that His wrath is real is backed by straightforward exegesis. Those who wish to say otherwise must twist scripture to an extent that if applied elsewhere could make God's love just as "unreal." The 'wrath of God' is not an attribute of God nor is it properly an accommodation. This is clear by determining first, what is an attribute of God and then under what causes the 'wrath of God' is made to appear in scripture. First, an attribute of God is something true of his nature always. For example God is always present, wise, powerful, holy, all knowing, etc., but not always filled with wrath. Second, in one sense everything in scripture is an accommodation in that God's unknowable transcendent qualities and ideas are reduced into human language in order to 'accommodate' to humans. However a proper 'accommodation' is where the scriptures even apparently contradict themselves, in order to accommodate to our inability to understand otherwise. Therefore if God is represented as 'walking among us' naturally it is an accommodated way of speaking, not to be taken literally. As God's anger is not an attribute of God it must be a result of an attribute and I've never encountered anyone not attributing it to his justice. For everywhere when we see God punishing sin, or threatening of a future punishment of sin, it is in connection with his justice being taken into account in the punishment of evil doing. When we speak of God's wrath we are clearly referring to his actions in, cursing man to death as a result of the sin of Adam, in sending a flood to destroy the world at the time of Noah, to manifest a hatred of sin in the capital punishments of the Old Testament Law, to represent the cup of wrath borne by Christ on the cross and to warm of the final judgment. Having clarified what God's anger is in the bible as clearly understood by any who read it, the question becomes wether or not God's punishment of sin as described by the word 'anger' is an accommodation or not, beyond the normal sense in which everything in scripture to a degree must be an accommodation to humans as it is written in human language. In other words is God's anger an accommodation more so then say for example, God's patience or God's eternal councils? The question is difficult because it depends on what a person really means by 'accommodation'. If we mean an intentional misuse of pure logic in order to explain something, like 'God walking among us', or 'God repenting', then obviously it is not an accommodation in that obvious sense as God will punish sinners and has punished sinners in the Bible. The bible is full of his punishment everywhere, there is no need to quote scripture in detail as all will confess his judgments recorded. However, if what is really meant is a method to reconcile God's anger with his love, as seeming contradictory attributes, then the question itself is a confusion of subjects as anger is not an attribute of God. God is love always and is an attribute. Love, loves was is good and beautiful and hates what is evil, by the very nature of the concept. Anger, as desiring the harm of another being is evil and the opposite of love. Therefore God's anger can't be ill-will in contradiction to his goodness. If someone thought his anger implied ill-will then they would be in distress to somehow reconcile 'anger' and possibly attempt to reconcile the contradiction through an assignment of an 'accommodation'. Well, in some sense that would be within reason based on the original confusion. However, there is no need to grasp at weak methods to resolve the supposed contradiction. The fact remains that God's anger is made plain to all humanity and so is his love in the gospel, love gets angry at injustice and hates evil. There is no contradiction to resolve. The saying is good, love the sinner and hate the sin. Literally Christ died in love for sinners. Literally God will punish all who refuse it. There is no special accommodation under either biblical fact. To us, anger means a racing pulse, manipulations of our facial muscles, a loud tone of voice and many other physical manifestations. God is only capable of these aspects of anger in the person of Christ in his incarnation, and he demonstrated them when he drove out money-changers, rebuked scribes and Pharisees and even his disciples. Apart from the Incarnate Christ, I would say such things are accommodations. But the second part - a forceful response to an offense or crime, does not require a human body, just a means of interacting with the creation. The curse upon Adam and Eve, the Flood, the Tower of Babel, Sodom and Gomorrah, the plagues on Egypt, the exile of the Israelites - these are all actions taken by God to punish sinful behavior. It is telling that the dictionary entry defines wrath based on God's behavior. Our wrath is the allegory, not God's. If the Wrath of God were an accommodation, how would it be so? 1) Is it an expression of something that the people who wrote the Bible could not understand because of their level of technology and scientific understanding of reality? 2) Is it an expression of something that no human regardless of knowledge and experience could understand properly? 3) Is it couched in figurative terms to be consistent with common idioms known to the original hearers but confusing to us? The first time God reveals his capacity for wrath is in Genesis when he warns Adam and Eve not to eat the fruit of the tree of the knowledge of good and evil or suffer death. At this time Adam and Eve were not sinners and no physical or mental infirmity had yet entered the creation. Thus this word did not need to address hearers who were blinded by sin or weakened by the curse and subsequent genetic defects. Also, language was new, so had not yet had a chance to become cluttered with confusing idioms. Adam and Eve were, however, finite and immature. A crucial instance when God revealed his wrath was when Christ suffered on the Cross. He bore the punishment for all mankind's sins. If we consider this merely a message to us, then we might have any number of reasons to declare it an accommodation. However, the wrath that God poured out upon his Son is most certainly a message from the Father to the Son. Jesus is not a sinner, is not (in his divinity) finite, is capable of understanding the message in all its fullness and (the thorny issue of kenosis aside) has access to all the scientific knowledge he needs in order to understand what he is being told. He experienced true wrath to punish real sin. It is at the very heart of the Gospel message. If it is merely an accommodation, so is everything else! If Christ was slain from the foundation of the world, his sacrifice is eternal, and the cause that required it is revealed to be eternal, namely God's wrath against sin (accompanied by his love, which caused his wrath to be directed against his Son and not us). Many of those who sleep in the dust of the ground will awake, these to everlasting life, but the others to disgrace and everlasting contempt. The fact of eternal punishment is an indicator that the wrath of God is an eternal attribute, not a temporary one. “When the Son of Man comes in his glory, and all the angels with him, he will sit on his glorious throne. All the nations will be gathered before him, and he will separate the people one from another as a shepherd separates the sheep from the goats. He will put the sheep on his right and the goats on his left." Jesus described this separation many times using parables, but the idea is clear. Wrath against sin is an eternal attribute of God. Not the answer you're looking for? Browse other questions tagged exegesis biblical-basis nature-of-god wrath-of-god accommodation or ask your own question. 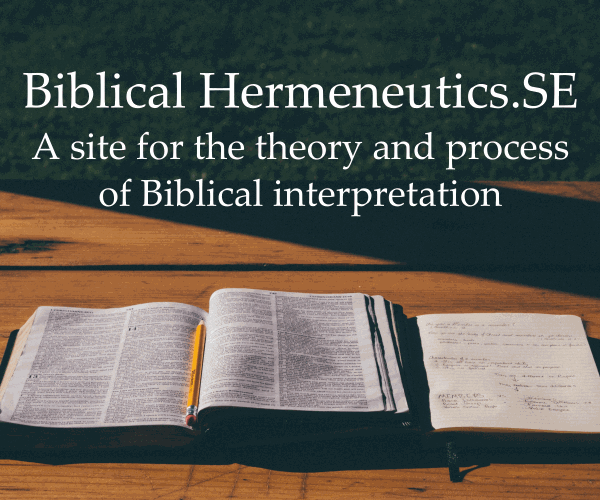 What is the Biblical basis for the “penal” in penal substitutionary atonement? Is God's wrath an anthropomorphism? Is there a Biblical basis for not believing that Global Warming is occurring? What is the Biblical basis for the idea that God doesn't have form? What does it mean that God's wrath is infinite and what is its relation to existence of life on other planets? To the Calvinist, what does it mean that in the beginning God already has His object of wrath?